Often we get sent things in the mail; letters from people, boxes of awesome things, whatever people want to send us (and this is so awesome btw, thank you to everyone who writes!). But life gets busy, we travel, we farm, we really love and prioritise seeing our families (and there are a lot of them, that live all over the world – so this takes up a lot of time! ha) and sometimes we don’t get around to saying thank you to each person that sends us something or sends a letter. And we also realise we don’t write on this (our “journal” if you will) enough. And recently, we received something in the mail that was a reminder, to be a bit more present. I think I mentioned it before, but this year for us is about being more present in all we do, slowing down a little. And this was our reminder. To pay attention. Recently we received some bottles of wine in the mail. Truthfully, they just looked like any other bottle of conventional wine. But, as we looked into them, we realised they weren’t. In fact, it was a very special kind of winery, doing things in a really creative and sustainable way – Yealands. Then we read Peter Yealands words, and we realised they are so much in line with ours. “[Sustainability]: Let’s not be afraid to fail and let’s celebrate our successes, let’s applaud our young innovators, let’s be courageous and bold and let’s look after our path as best we can.” (page 18 “A bloke for all seasons, the Peter Yealands Story”, by Tom Percy). Sustainability, is truly something that we see as forever expanding, something that requires new inspiration, new ideas, new concepts. And we can see how this winery has inspired many other wineries to follow in their footsteps, that otherwise wouldn’t have walked down the sustainability path. And they have inspired us. The Yealands team are also running a giveaway right now of cases of their sauvignon blanc! So we agreed not only to share with you some of their sustainable farming ideas, but additionally, to make a seasonal salad for the blog with a splash of their Sauvignon Blanc to get you all excited for that. 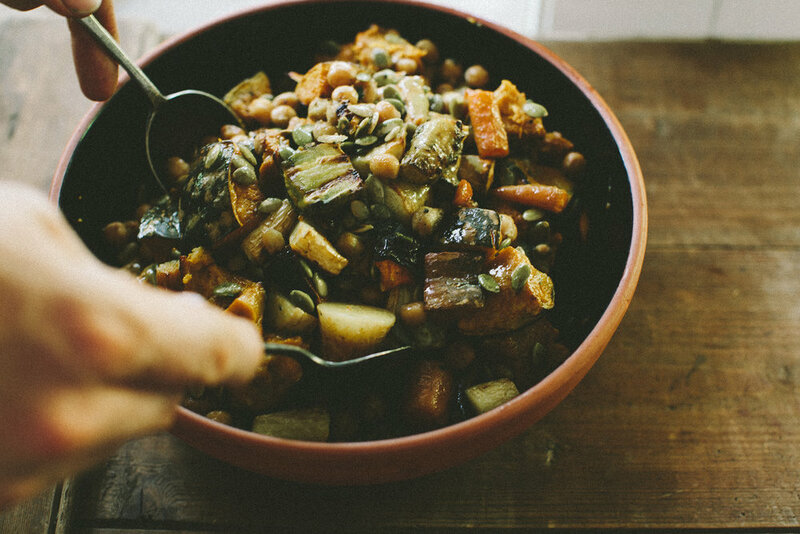 Normally we just drink wine, but this time we decided to explore the flavours, and include it in the dish – a super seasonal salad, with all the Autumn vegetables! It’s full of sweet, toasty, nutty and honey flavours. The wine is a bit fruity, especially passion fruity and peachy, and a little minerally, so flavours that are sweet, toasty and nutty go really well. It’s a salad, but it’s as filling as a meal, and super wholesome. Let us know your thoughts. Miniature pigs & sheep for grazing between the vines: specifically, they use “Babydoll” sheep and “Kunekune” pigs to graze vineyard rows. Put them between the vines year round and they are so small they can’t reach the fruit. This means no mowing, reduction of fossil fuels and carbon emissions and the ground becomes fertilized by their manure as they go. Collect wine cuttings: Collect the cuttings and use them to burn as fuel. Super-efficient. Or alternatively, they are great for smoking meats! Chickens: Let these roam through the vines as pest control, and you get bonus eggs. Like ours, many are “saved” from large battery hen farms – do this if you can. Play classical music to your vines/plants: Studies show that plants (and vines) respond positively to vibrations of sound waves. Additionally, Yealands report that their chickens located closest to the music lay eggs around 16% bigger than the others. Compost mixtures: The Yealands team compost down bark, mussel shells, seaweed, lime, cattle paunch, and grape marc (waste) – a great mixture to improve soil fertility, increase water retention, and reduce waste to landfill. Liberally oil two large baking trays with olive oil. Vegetables: Place vegetables on baking trays and season well with salt and pepper. Toss vegetables with your hands so all are coated well with salt, pepper and olive oil. Place in the oven for 30 minutes. While vegetables are cooking, make the dressing and toast the chickpeas & seeds. Chickpeas & seeds: heat a medium cast iron fry pan to med-hot heat. Liberally coat with olive oil. Place black pepper, parsley stems and chick peas in pan and fry for about 8 minutes, occasionally shaking pan to move them around and so they don’t stick. Chickpeas will pop a little as they go! Add extra olive oil as needed (if sticking). Add pumpkin seeds and fry for a further 2-3 min, again, occasionally shaking the pan so they don’t stick. The mixture should be slightly browned and crispy. Set aside. Dressing: Place all ingredients into a blender, blend well. It should be well combined and bright lime green in colour. Set aside. Vegetables should now be ready. Switch the oven to grill, and continue to cook the vegetables for a further 5 minutes. Remove from oven. Vegetables should now be golden brown, soft and slightly crispy. In a large salad bowl, combine vegetables, the chickpeas and seeds mixture and the dressing. Gently toss until combined. For detailed information on cooking and preparation of beans, like chickpeas see our book. Or we have a quick guide in our blog archives here. PS. Win one of 90(!) Cellar Door Packs of Peter Yealands sauvingon blanc with 6 bottles! To enter and for T&C’s head here. Additionally, if you love wine, you can get involved in International Sauv Blanc day by posting pictures with the #ExpressYourSauv.